This week, Elvis Costello is releasing Wise Up Ghost, an album he recorded with The Roots. It’s a strange move for The Attractions’ frontman, especially for those who know him from his mellow recent work and his wacky, hat-wearing persona. In fact, a cursory glimpse at 59-year-old Costello makes it pretty easy to forget that at one point not all that long ago, Costello was an angry, angry young man. 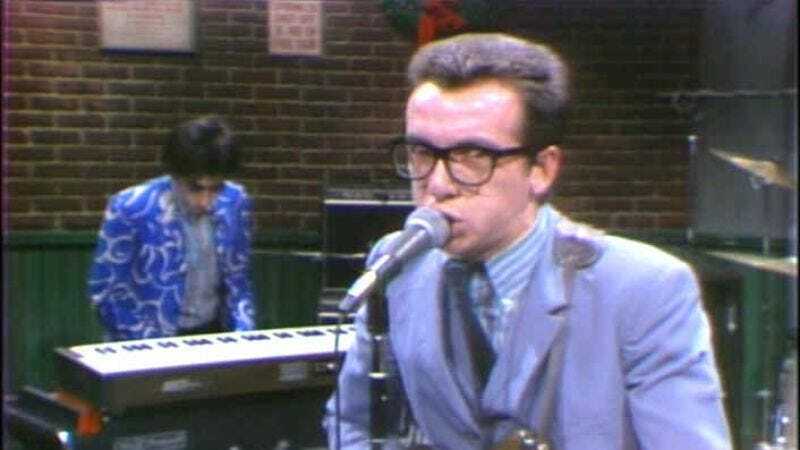 What happened is SNL legend, but the short of it is this: Costello played a few bars of “Less Than Zero” before halting the performance, saying, “I’m sorry, ladies and gentlemen. There’s no reason to do this song here,” and then calling an audible to his band. The group then launches into “Radio, Radio,” a sharp critique of the commercialization broadcasts of live music, and the control that record labels wield over artists. That simple act made a big point, and earned Costello the respect and attention of a lot of music fans. It also earned Costello a 10-year ban from SNL. With Miley Cyrus feigning masturbation at today’s VMAs and acts like Kanye West and 50 Cent making personal moments political at the Grammys, Costello’s simple song switch doesn’t really seem like that big a deal. In actuality, it’s what he did—taking control of his music, his image, and his audience—that has led (in part, at least) to the Cyruses of today. Costello wasn’t about to be controlled by a musical machine, and with one short song, he let the world know who he was and what they could expect from him for years to come.